NEC PC-Engine Arcade CD-ROM published 25 years ago by Hudson Soft. World Heroes 2 © 1994 Hudson Soft [Hudson Group]. 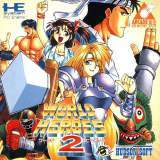 World Heroes 2 for PC-Engine CD was released on June 04, 1994 in Japan.